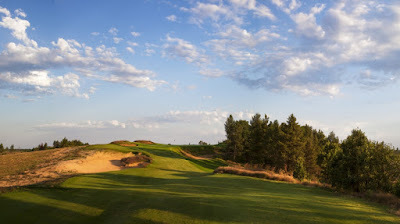 I am so stoked to report that I will be visiting Sand Valley this summer as part of a marathon Midwest golf trip and as I don't have a lot of golf experience in Wisconsin, Illinois, etc. I thought I would fill you guys in on my preparations for the big trip! I am flying into Chicago and Sand Valley is way up there in Northwestern Wisconsin near the small town of Nekoosa. One thing you can count on with Mike Keiser golf resorts (like Bandon) is that they are going to be OUT of the way and you have to earn your tee time just getting there. Personally, I can't wait for a roadtrip and I am already planning on hitting courses in Wisconsin (Lawsonia) and in Illinois (Black Sheep or Harborside) on the back and forth. The first thing I always research for any golf trip is the expected weather when I am going to be there. Deep in the heart of August, Wisconsin has some crazy weather highs and lows. The max temp seems to be 93 and the low is 45 and August looks to be in the middle of the pack regarding rain. Given all of this, I think I am definitely packing light (shorts, lots o' sunscreen not so much jackets) and maybe a few light layers if it cools off at night. I am really interested in the food philosophy of the resort as once you make the trek there, I hear the food prices are not just reasonable but at a low cost. Outside of the resort, I have been hearing about these Supper Clubs in Wisconsin. Supper Clubs are a relic from the era just after Prohibition where liquor licenses were granted to restaurants outside city limits. I really would like to go to one of these! You don't think of the desert when you think of Wisconsin but due to the geologic process over millions of years, yup there is sand in Sand Valley! I will be fascinated to see just how sandy it is there is Wisconsin (just as long as there is no sand in my cheese I will be happy! ).